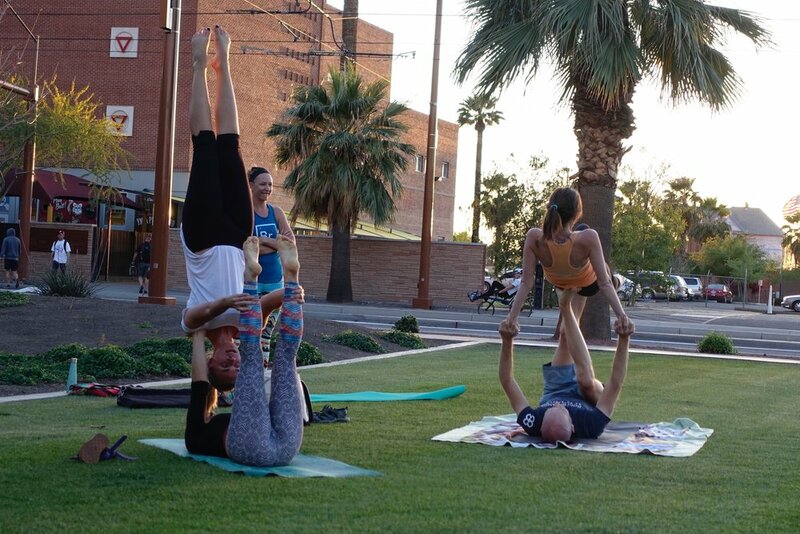 An acro jam is an informal meetup where people come together to practice AcroYoga. What is AcroYoga you say? AcroYoga is a practice where two or more people create different poses together that are sometimes acrobatic and sometimes therapeutic. See above picture. Unlike a class or workshop, there is no formal instruction provided at a jam. If you are new you can learn at first by observing and then asking someone who is more experienced to help you learn something you've seen. Depending on who shows up, other related practices can go on - juggling, hooping, acrobatics, hand balancing, yoga, dance, cheer, etc. When? Every Tuesday from 6pm to 8pm. End times vary each week depending on interest and who shows up. Who comes? Yogis, newbies, jugglers, acrobats, flight attendants, dancers, photographers, professors, moms, kids, dogs, professionals, people in town visiting family, vanlifers, martial artists, vagabonders, road trippers, and You. Everyone is welcome but it is recommended that you have taken at least 1 AcroYoga class first. Do I need a partner? Nope. What Should I bring? A yoga mat, water, enthusiasm! How do I get there? Any way you like, we have people who walk, bike, take the light rail and drive. The address is 424 N. Central Ave, Phoenix, Arizona. Parking: Parking is not the easiest as this park was designed to encourage pedestrians, cyclists, and users of mass transit. It is doable though if you follow these instructions: Nearby metered parking is available on the west side N Central Ave, just south of West Fillmore. You have to be going north on this part of N Central Ave to access the parking as the light rail runs down the center of the street. More metered parking is available on the south side of West Fillmore between North Central and 1st Ave. Bring coins and/or credit card for parking. Nearest Light Rail Station: Central Ave and Van Buren St.
Bathrooms: Nearest reliable bathroom is at Subway - directly east of where the jam usually is held. 555 N Central Ave.
AcroYoga.org Webpage. This is where you can order the AcroYoga manual and find out about upcoming immersions, jams, and teachers trainings held worldwide.